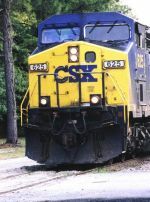 Description: CSX 625 leads another GE unit on a northbound intermodal train at Florence, S.C. Description: CSX 625 moves an eastbound stack train single-handedly under the signals at Milepost 215. Description: Q429 passing the summit of Washington Hill. Description: Q429 at the summit of the Berkshires. Description: Q119 westbound near MP 138. Description: Q416, with three GE's running in elephant style, crosses the Potomac River and heads into West Virginia enroute to Cumberland, MD. Description: Westbound CSX 625 approaches the Utica, NY train station. Description: CSXT SD70AC 4721 leads trailer train Q172 east off the Philly sub approaching CP Park. Description: Q148 running on track 2 with headlight dimmed as he is about to meet Q359. Description: CSX WB with CSXT 625 and 8712. Description: Q119 westbound at Fonda. Description: Q119 westbound at Broadway.